Madhuri's father died a few years ago because a snake bite. The rest of her family must travel from the village to find work, so there is no one to take care of her. 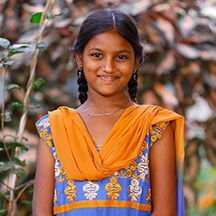 Sponsorship would provide Madhuri with an education and basic needs.